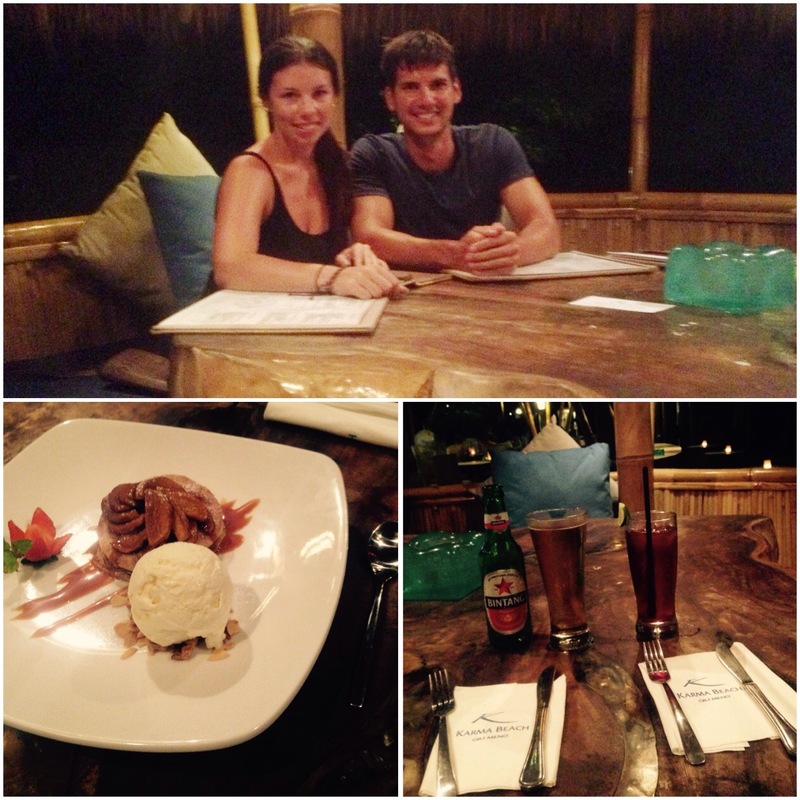 We only had a day/night in Bohol and we had lots we wanted to see so a tour seemed like the best option for us. Most tour shops close at 6pm so if you get to Tagbilaran late, you are limited with choice. Head to the Sealine travel shop in the shopping mall, East of rival park and they are open later. The travel shop is on the first floor, next to the big sports shop. In the travel shop you can book on organised tours ranging from 1000-1500php per person. This includes additional places like the Butterfly park, man made forests and zip lining. They also provide lunch for you. The price of your tour is dependant on the number of passengers (the more of you there is the cheaper it gets). In the end, we opted for hiring a private car for the day as it worked out cheaper, and we had the freedom to choose the places we wanted to go. Our driver also dropped us back to get our bags at the end of the day and straight to the pier to get the ferry back to Cebu, all for just 1500 PHP! On our tour we visited the Tarsier Sanctuary and the Loboc river. We also headed to the Loboc floating restaurant as recommended by our driver. We were actually unaware that this was a package lunch and river cruise. Unfortunately we ate just before we headed off so we weren’t hungry enough to take advantage of this. It did however, look like the cruise wouldve been a lovely experience and it only costs 250 PHP per person for lunch. Please let me know how what it’s like if you go and experience this! After having been and seen all of these types of tourists I’ve decided to put together a post on how I categorise my style of living while travelling based on budgets, luxuries and what we do. -Drink to get drunk on any drink you choose. Maybe even a bottle? It’s only 30 quid. -Taxis and tours all the way – who exercises on holiday? 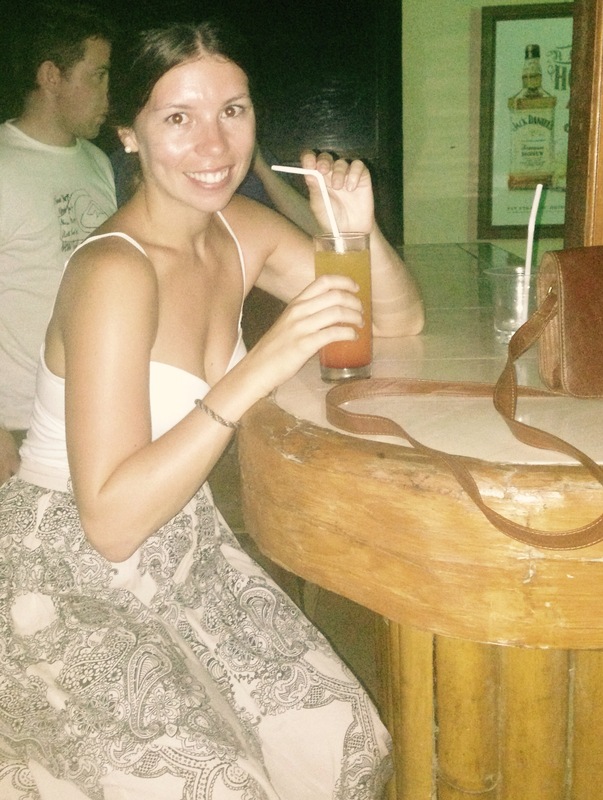 We went to a fair few bars in Ho Chi Minh but here are my 3 favourites! The view hotel bar A very cool 8th floor bar on the main strip with surprisingly inexpensive beer. 333 beer at 20,000 dong? That’s traveller prices in a roof top bar which was highly unexpected. Or why not have a giant Tiger for a mere 50p extra. 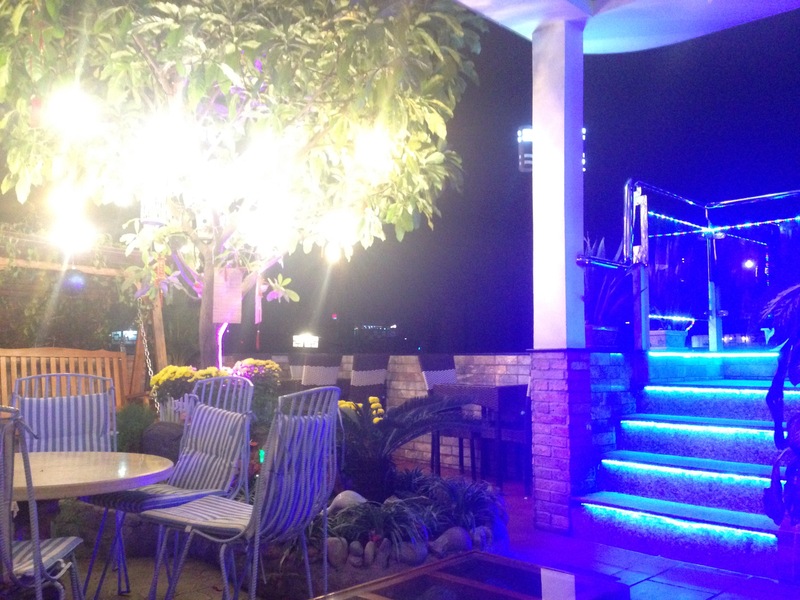 This place has a super relaxed atmosphere, pretty lights, lovely scenery and an OK view of the city. I’m sure you can find better views in sky bar or other rooftops but this is well worth a drink. Guess what, it even had a swing! Although the prices here aren’t very traveller friendly (unless you buy 3 drinks for the price of 2 or again.. drink beer), it’s well worth a stop. 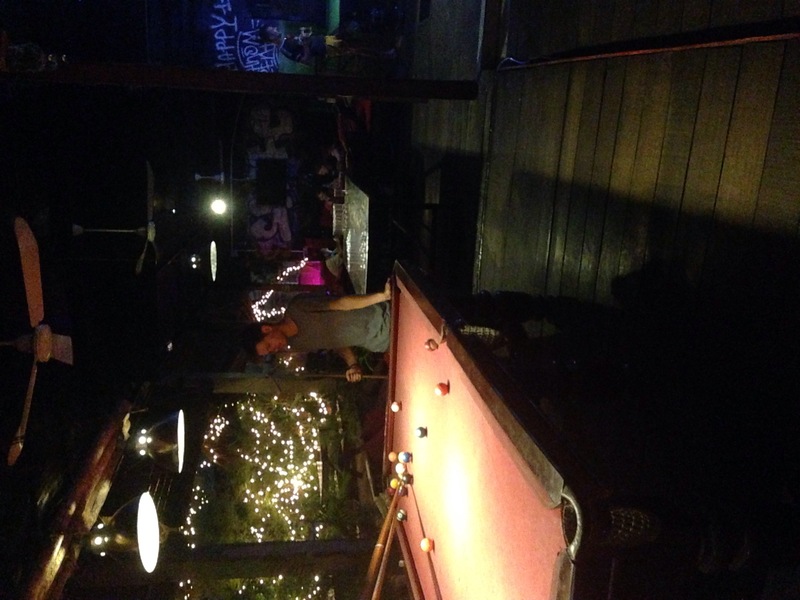 The bar is situated over 3 floors and include foozeball, darts and pool tables making it a super fun place to hang out. One for those with sports obsessed boyfriends. This is a sports bar with the added luxury of a really good singer who performs there every other night, keeping us girls occupied while the boys shout at the tv. This ones around the other side. 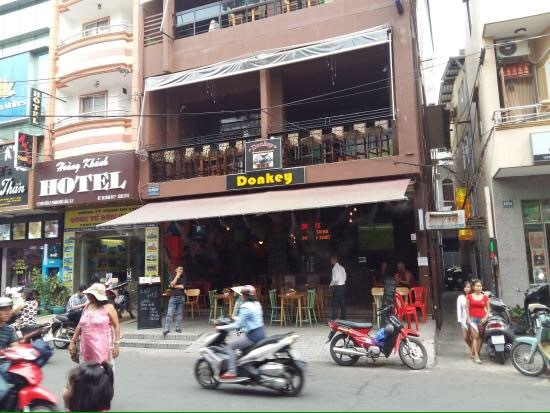 What’s your favourite bar in Saigon – or which one of these looks like one you’d most enjoy? 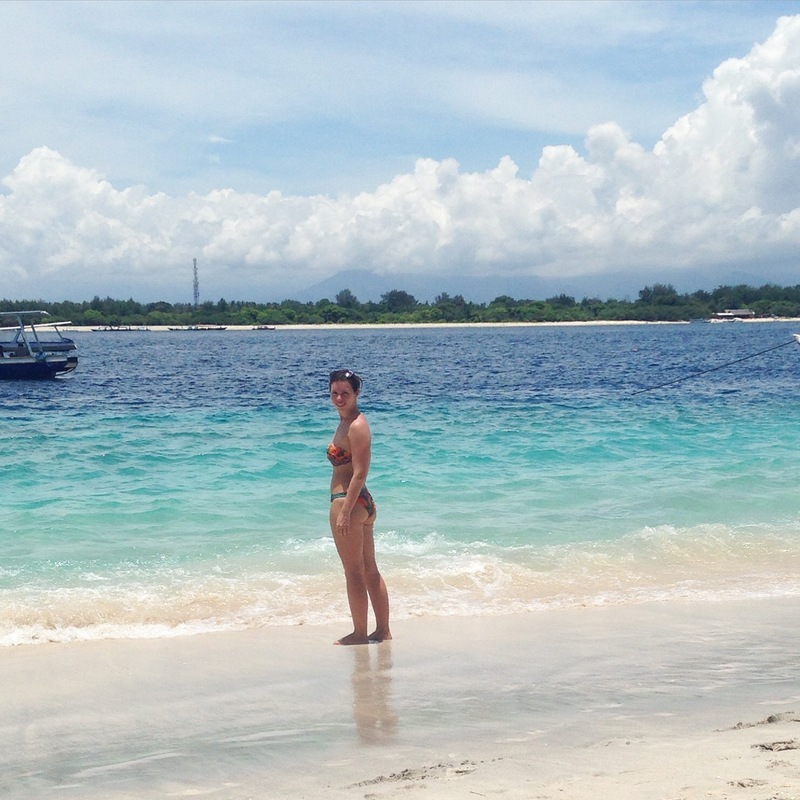 Gili Islands = paradise. They are my favourite place of my whole travelling experience, and a great place to end the phenomenal journey I’ve been on. 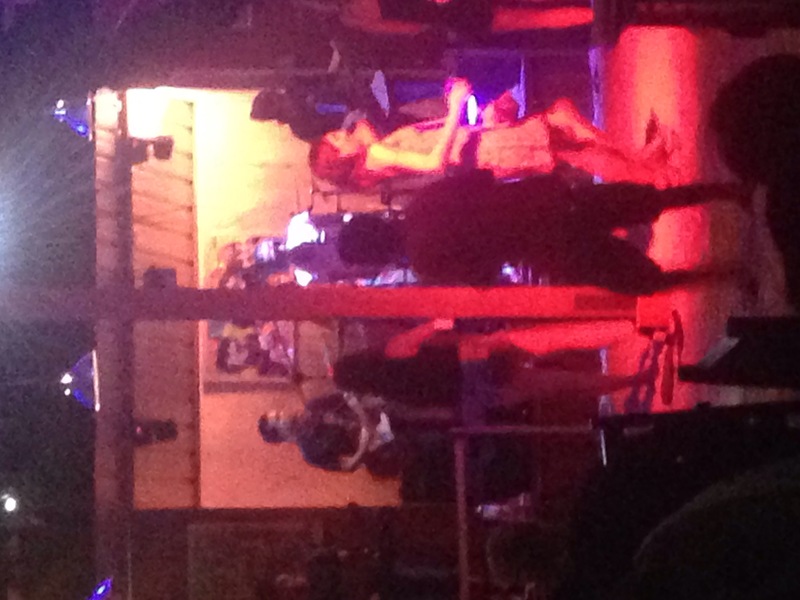 Known for its strip of bars and lovely restaurants, Gili T is lively, fun and there’s always something going on. There’s lots of activities to keep everyone occupied for days, with the added beauty of a scenic beach. 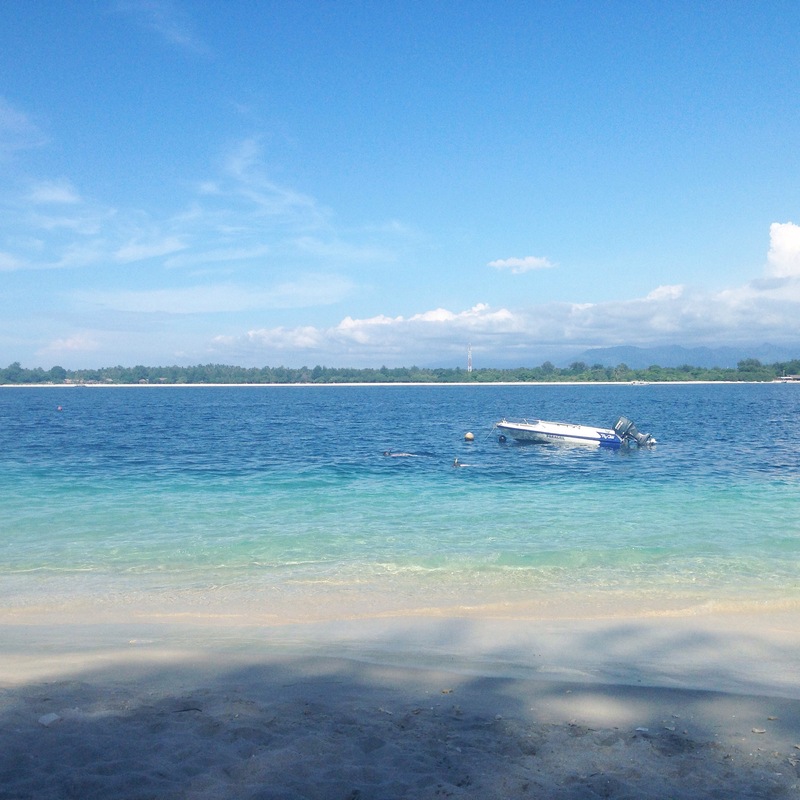 Grab an amazing juice or smoothie at Trawangan Dive Resort as you bask in the sun with this stunning view.. The Terminal serves a mean burger and plays all sorts of sports (we watch the McGregor vs Diaz UFC fight here). Alfia bungalows is right off the beach and a 2 minute walk from the pier. For just 200k you have a lovely room complete with tv and video. Wifi, a nice breakfast And really lovely staff. On this island you can do yoga, learn to surf and wakeboard, dive, snorkel and even moonwalk underwater! Gili meno is relaxation bliss. It’s very quiet and there is no nightlife, just some restaurants. It’s a very peaceful island where you go to completely unwind. If you go out at night, be sure to bring your phone as a torch, most of the pathways are unlit. 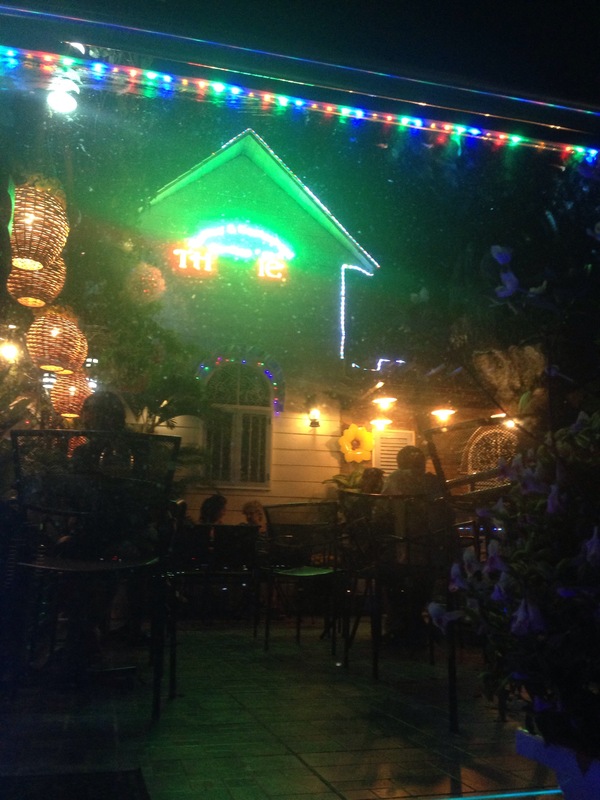 We spent our evening here at Karma restaurant. It’s absolutely beautiful with a romantics ambience and it’s featured in the top Gili Magazines. Needless to say it’s was very expensive ‘backpacker’ wise but we decided to treat ourselves. 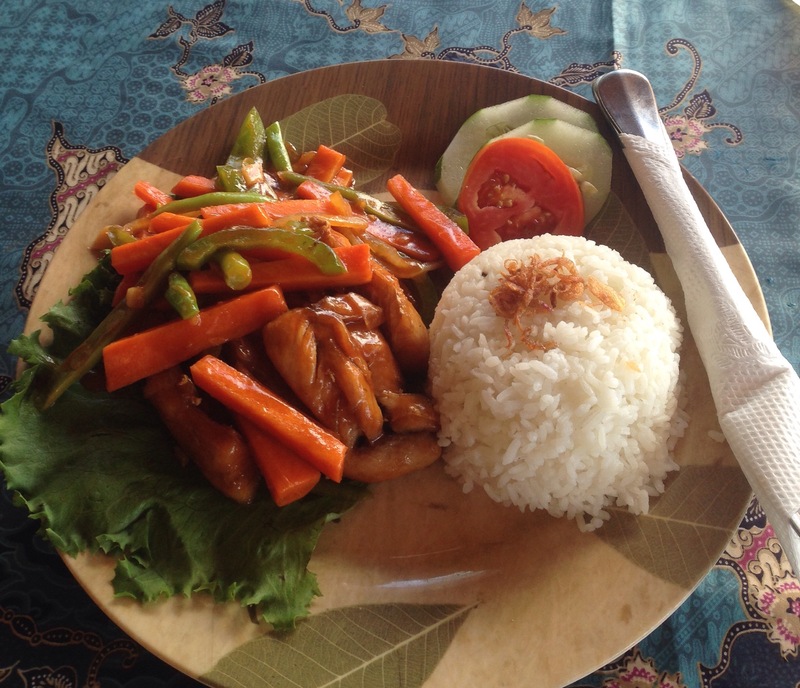 Be careful in Gili Meno as the ‘nice’ restaurants here add 21% tax to your bill! We stayed in Putri homestay. 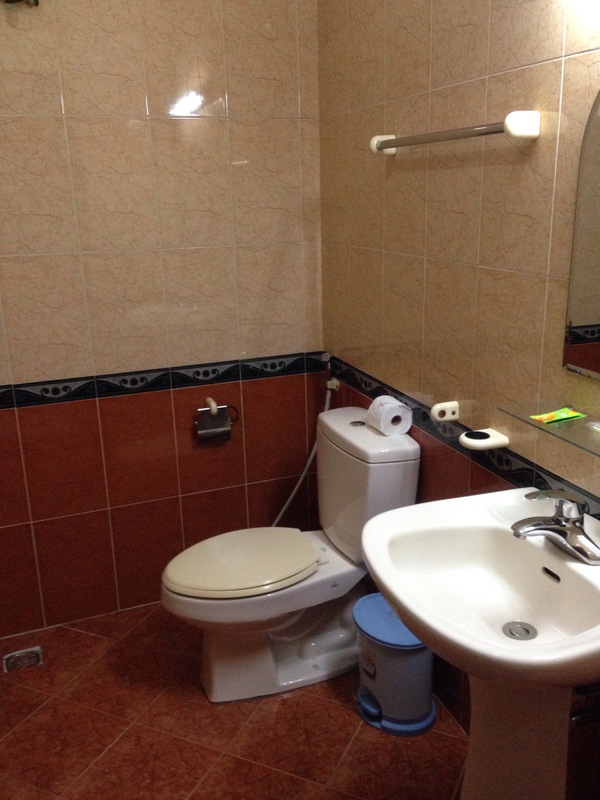 Cheap and clean and a 5 minute walk from the beach and restaurants. There were no windows in the bathroom so mozzies could get in but this was somethin we we’re very used to by now. We was however, provided with a mozzie repellent plug and a safety deposit box. A very nice breakfast was included too so it’s well worth the money! Agh Aza zil bungalows, probably one of my accommodation highlights of our whole trip! 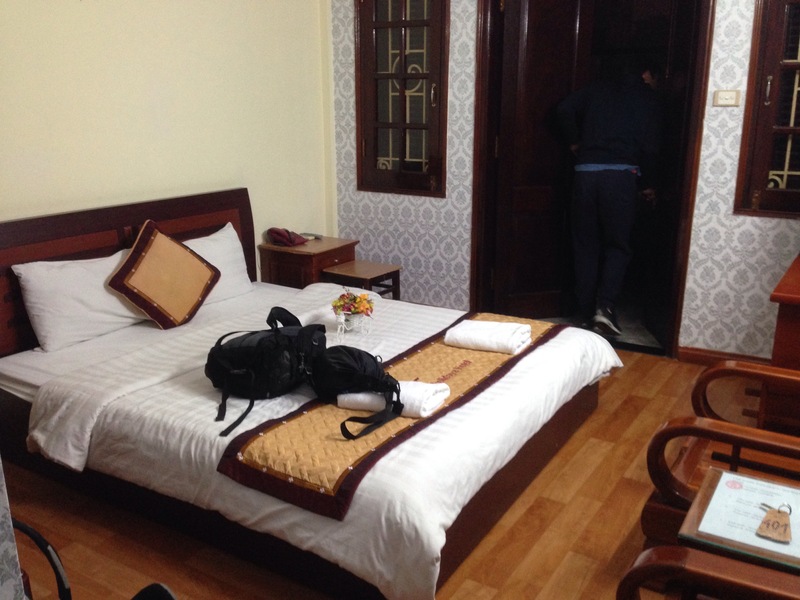 I could not recommend this place highly enough and still cannot believe it was only £10 per night! I hope you found this post useful! 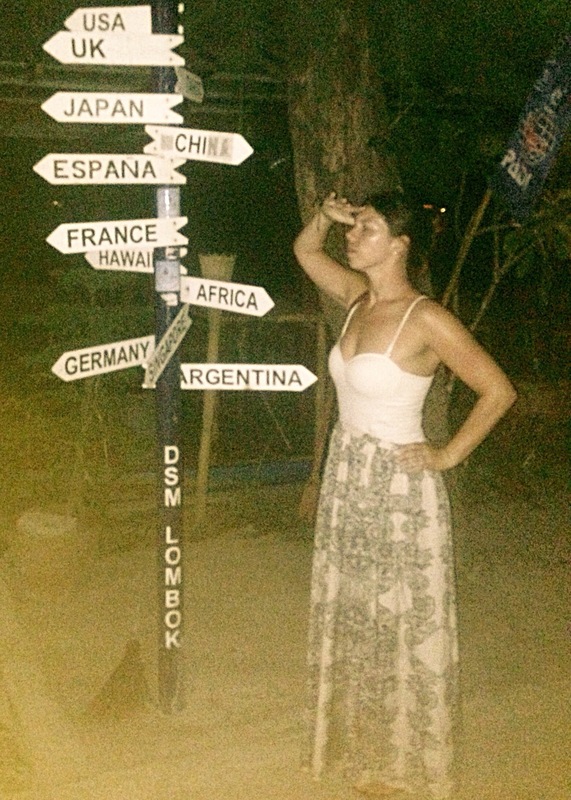 If you need any help planning your trip to the Gilis, feel free to ask. The ultimate list from North to South Locations. Hey guys, I know it’s always confusing trying to find hotels/hostels to stay when you’re travelling around. Especially when you don’t know the areas! So I’m here to give you my honest opinions and recommendations on what we’ve come across along the way. Liam and I have stayed in mostly guest houses as were a couple, but I’ve added info for solo backpackers too, hopes this helps! A bunk in a dorm is around £6-8 per night. This place is huge and you will definitely make some friends here. 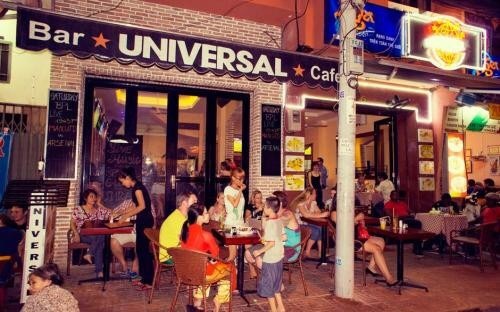 They have a bar downstairs with entertainment and it is right in the heart of old quarter where all the nightlife is. 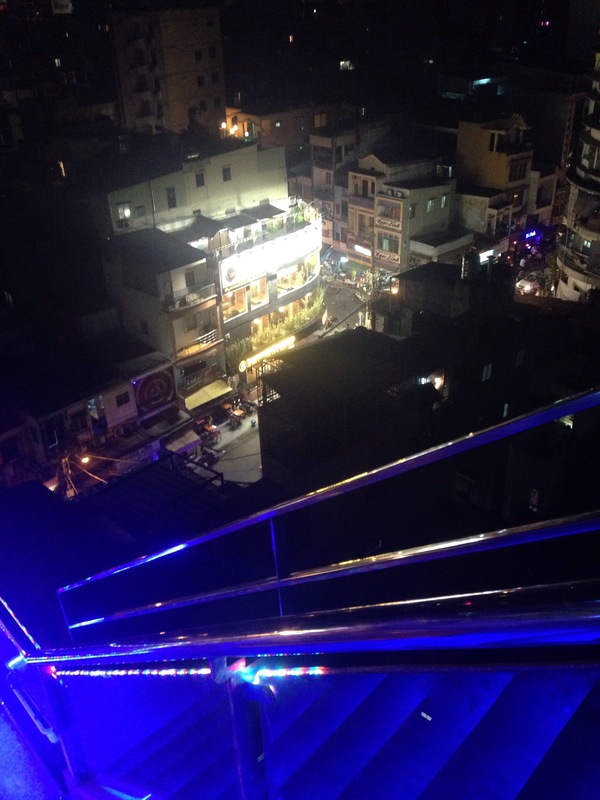 This is on a small street called Ngo Huyen, next to Ly Quoc Su temple. Philippines. From Donsol (West Philippines) you can get to Cebu via a boat and ferry. The first boat you need to get is to ‘Masbate’. This leaves from Pilar port daily at varied hours (Pilar is a 30 minute jeepney drive fromDonsol) . The jeepney is an experience in itself. We were lucky enough to ride on the roof! The journey from Pilar to Masbate takes 2-3 hours depending on whether you choose a fast or slow boat. On a Sunday we arrived in Pilar Port, but we didn’t really have a particular boat option. There only seemed to be one ticket office for a 3 hour boat to Masbate that left at 1pm. So we jumped into the cramped Catamarang and off we went. From Masbate you will need to get a ferry to Cebu. We were told in Donsol that these depart at 6pm every Tuesday, Thursday and Saturday and arrive at 8am the following day. When we arrived in Masbate, this was not the case. After our 3 hour boat journey from Pilar, we was told by the tourist police that the transasia boat actually no longer runs to Cebu city? How true this is we’ll never know but basically most information advertised in Donsol is wrong! There is however, a boat that goes from Cataingan (South of Masbate) to Bogo (North Cebu) everyday, at 12pm and at 7pm. The nice tourist lady gave us a lift to a hotel called Novo, where we stayed for the night in Masbate. The next day we grabbed a tricycle to the Masbate city bus terminal at 8am, and caught the 2 hour bus journey to Cataingan at 9am. They leave every hour and the bus cost 120 PHP per person. We also paid for an extra seat for our backpacks as there is no space to put luggage anywhere. We was told that the ferry from Cataingan takes 8 hours. However we arrived at the Port just after 5.30pm. Something to take into consideration if you want to take the 7pm boat. The cost 455 PHP per person. Luckily for us this ended up being beneficial as Bogo is to the North and is a lot closer to Malapascua Island where we were heading. If you are looking to go to Cebu city, you would have to get a bus from Bogo following your ferry journey. This is my view and my opinion based on my own experiences. By no means do I intend to offend anyone, needless to say as a tourist you may have a completely different experience to mine. 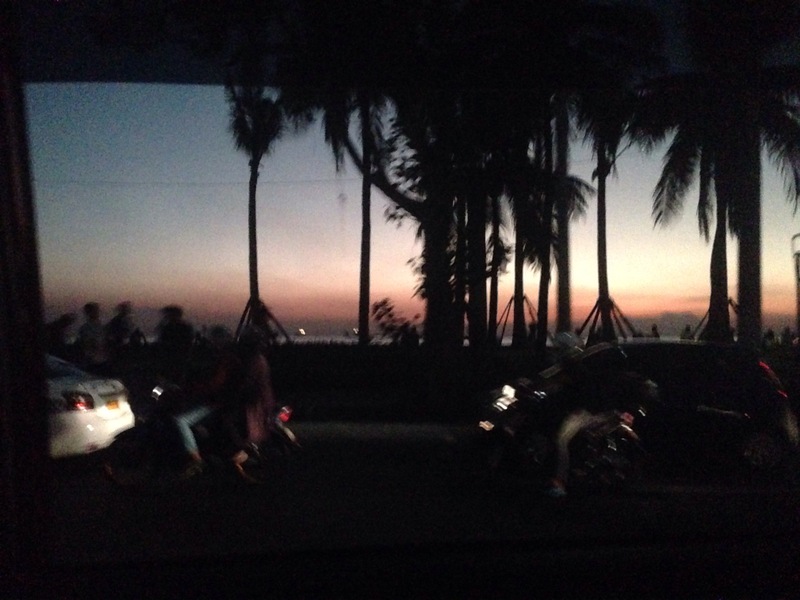 I am sorry to say that my time in Manila was less than magical. Although the city is a main hub for the whole country and its home to an international business district; the place itself for me was undesirable. I got an unsafe vibe from this city from the moment I set foot there, resulting in me not really wanting to leave my hotel. It’s so hard to explain and I can’t put my finger on it. Maybe it was the way people stared and laughed at us as we walked down the street? Now I’m no stranger to locals staring us at us questionably, I had travelled Asia for over 3 months after all. This time it just felt very different. It was more judgemental than inquisitive. Was it worth the money you spent? Was it worth quitting your job for? Was it worth having to start ‘all over again’? It’s Monday, I’m home in London and I’m unemployed. In the last four months I have watched beautiful sunsets over horizons and mountains. I’ve swam next to Whale Sharks and turtles and explored the inside of one of the biggest caves in the world. I’ve selfie’d in front of beautiful viewpoints and took in sights that are postcard worthy. I exposed myself to the horror of a ping pong show and drank from coconuts and cups made of bamboo shoots. I rode a bus through the borders of countries. I made new friends and missed old ones, sat listening in awe to some amazing stories, fascinated by the lives of people I barely know. I fell in love with the feeling of the warm sand between my toes and the lazy afternoons spent reading books and sleeping in hammocks. Ive woke up startled in the early hours to the alarms of rooster cries and have slept in shacks barely roofed, similar to the locals homes. I flushed toilets using buckets of water and slept in a bed too small to fit my feet in. Spent many a nights on cramped sleeper buses too, all part of the appreciation for what I have at home. I looked into the eyes of a Tarsier, one of the worlds most unique of creatures. Had my toes nibbled as I swam in a lake. Caught and ate a giant tuna and indulged on the flavour of barracuda steak. I enjoyed the absence of my phone, embracing the beauty of the world around me. My pasty skin has suffered hundreds of mosquito bites, attacks by mysterious insects, cuts, grazes and some serious sunburn. I found myself caught in a tropical thunderstorm and danced freely in the pouring rain. 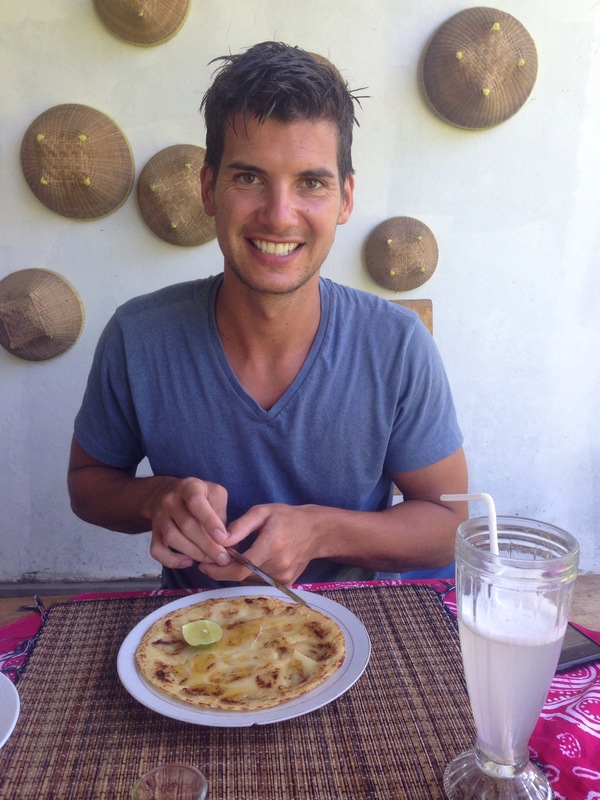 I experimented with worldly food, sometimes contracting bugs and sickness. I lost weight and gained weight. Starved myself for days to rid my body of food poisoning. Gorged for days on unhealthy carbs. I quad biked around white sand dunes, was taken downstream by the current of a river and have laughed so hard I almost wee’d myself. 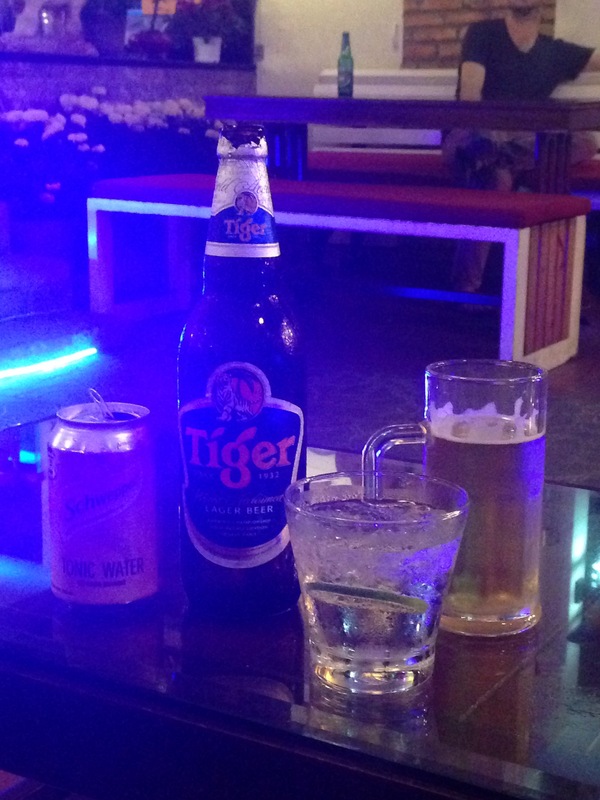 I have tasted the sweetness of raw sugar cane and have experimented with many different types of cheap Asian beer. 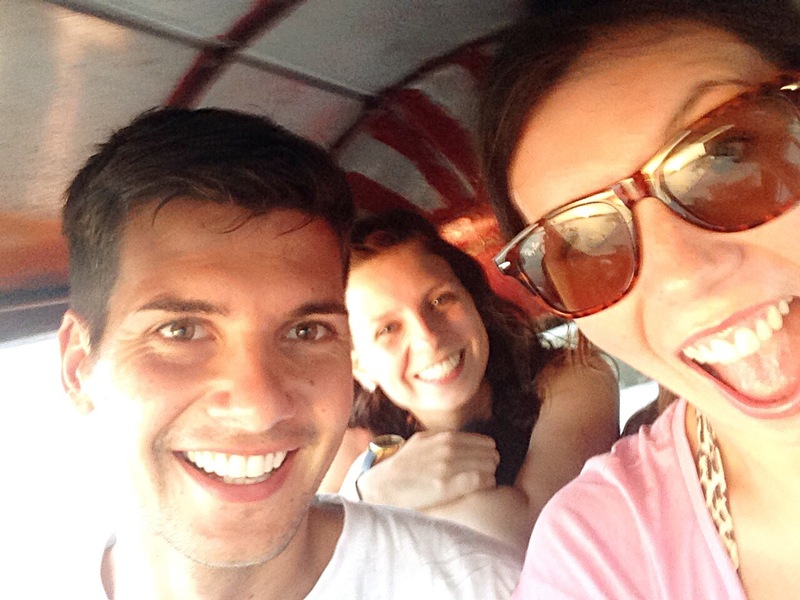 I hesitated to ride the roof of a jeepney, only for it to be one of my travel highlights in Asia. Ive experienced a strange Thai massage in Bangkok that I’ll remember for years to come. I slid from the top of rocks and jumped feet first through waterfalls. Walked through prisons where thousands of people were tortured and educated myself on shocking historical events. I shared food with kind locals on a ferry, climbed hills and dangerous pathways, trekked kilometres through stones and mud in only my flip flops and stumped my toe numerous times on bricks in the road. I revelled in the free time to reflect, without being interrupted by lack of time or chores for the day. I witnessed the most breathtaking of sceneries. I partied in the middle of a jungle and spent Christmas dancing on a beach covered in glow paint. I drank buckets until I could no longer stand and have felt the buzz of pure red bull. I’ve lived high on life. I’ve felt lucky and thankful everyday for what I was born into. I’ve witnessed people live in poverty yet still find the strength to smile and appreciate life. 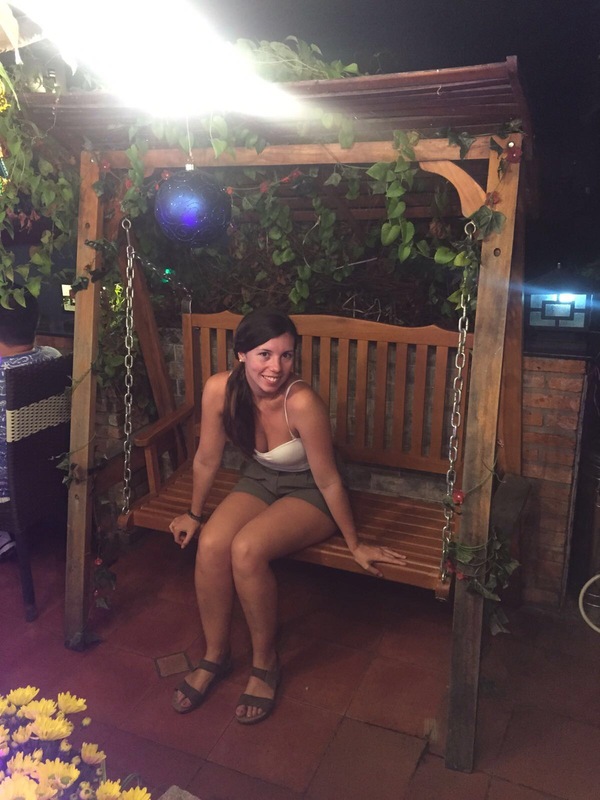 I walked through sand that glitters, cut my feet on the ridges of coral and shuffled on my bum through the Cu Chi tunnels. I washed frequently in freezing water and experienced adrenaline on the back of a motorbike. I’ve roamed freely with no plan of action, visited world heritage sites, dined in the dark and zip lined from a lighthouse. 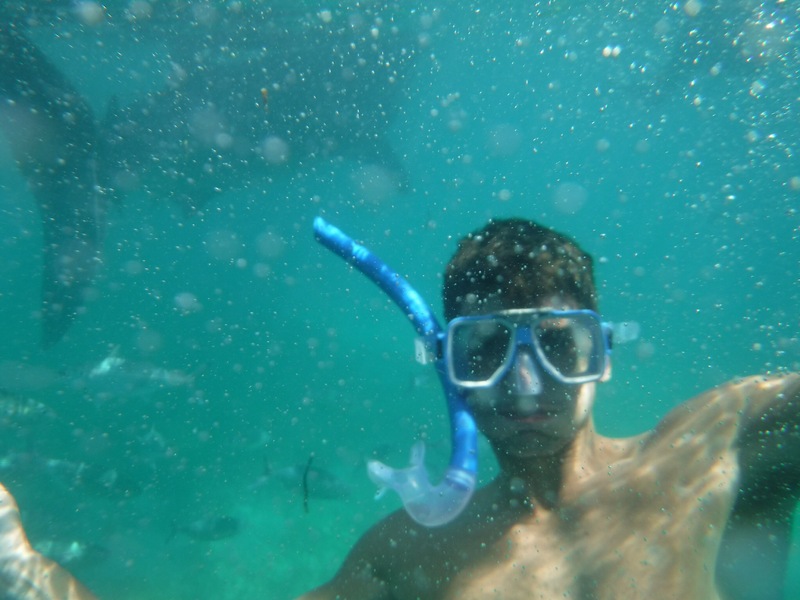 Swam in waters so clear that I could see starfish at the bottom.Sunbathed on the most blissful of beaches. I felt unsafe in the heart of a city and played chicken on the craziest of roads. Touched my hand over the carvings of temples hundreds of years old and climbed up giant statues. I came face to face with tigers, fed and bathed a baby elephant, floated in a pool of mud in a dark cave and bamboo rafted down a flowing river. I hustled and bustled through street markets and haggled until blue in the face. Purchased clothing on stalls for under a pound, learnt the basics of a few languages and interacted with those from all walks of life. I have soaked in the culture of 7 different countries and share some of my best memories with people that I only know the names of. I have learnt a great deal about life and a greater deal about myself. In answer to the questions above I say yes 100%. ‘Because travel is the only thing you buy that’s makes you richer’. Did you know that Indonesia is one of the only countries in the world that inhabits all 7 species of turtle? Pretty cool huh? Liam and I took full advantage of this and booked ourself on a tour to snorkel around all three of the Gili islands yesterday. 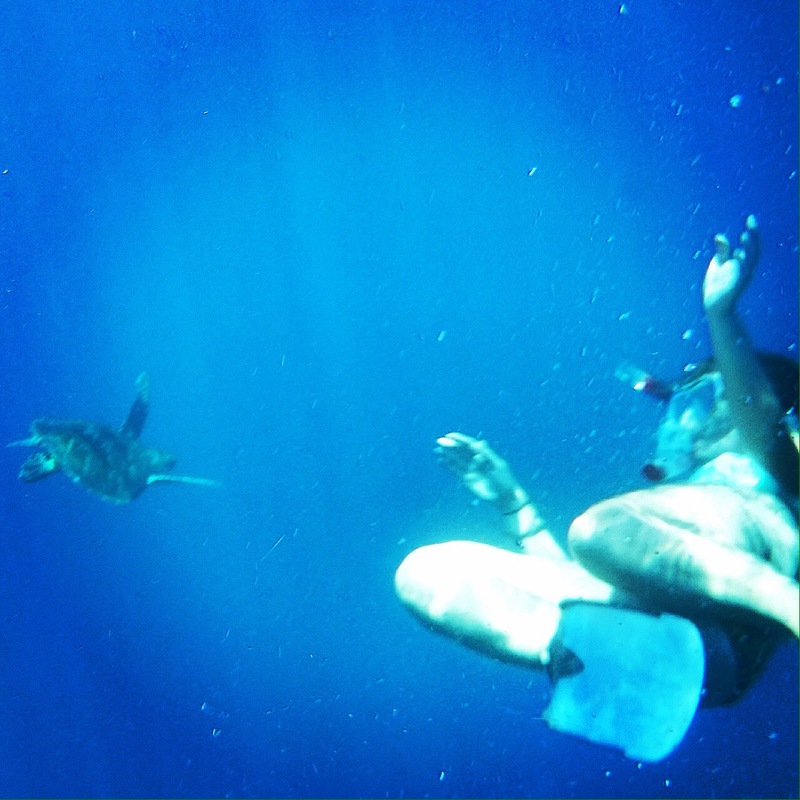 We went on a mission to spot as many turtles as we could. We set off from the harbour in a small boat at 10am with Cha Cha tours. A mere 100k each paid for our whole trip that included the rental of a snorkel, mask and fins. We swam in 2 spots in the morning. 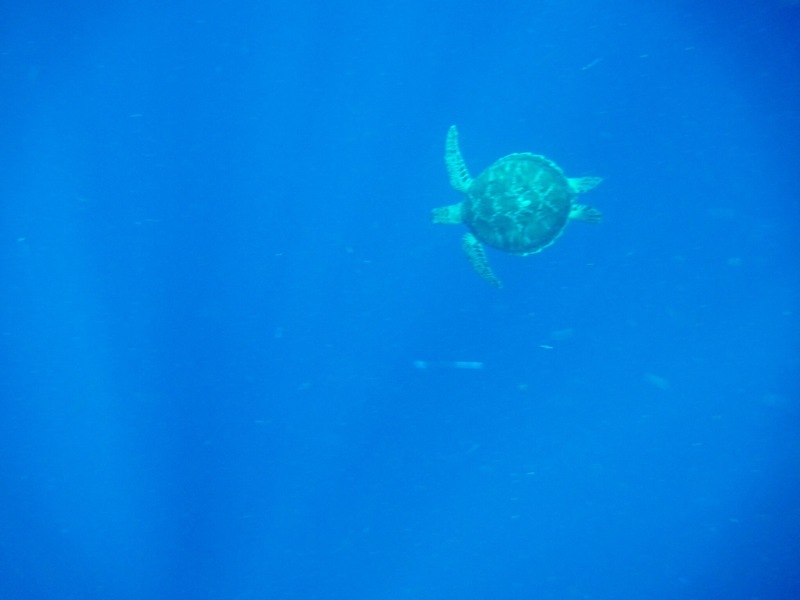 The tour guide leads you around and luckily for us we found a turtle swimming near the surface as soon as we jumped in. He/she was so calm, swimming gracefully through the water, not at all startled by us humans. 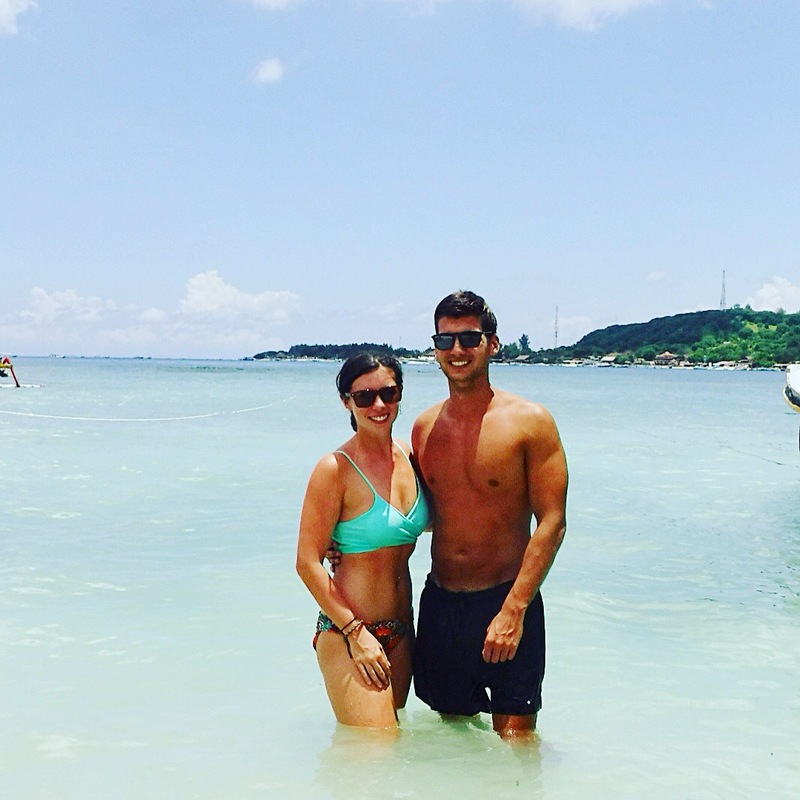 I’m pretty sure they’re used to sharing the sands of the Gilis with us tourists by now to be fair. After we had worked up an appetite in our first two sessions, we headed for lunch overlooking the beautiful beach at Sasak Cafe on Gili Meno. We had already seen 5 turtles by this point! 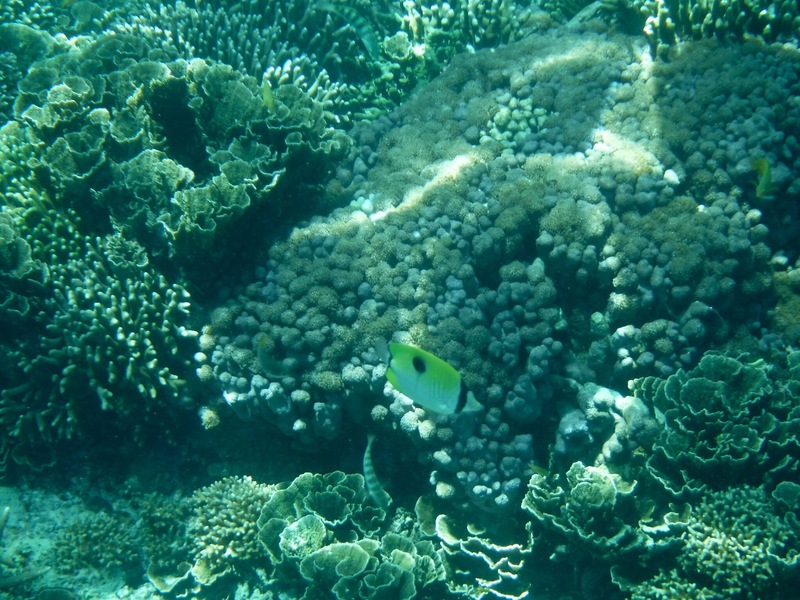 At our last two swimming spots, not only did we see 2 more turtles, we saw a wide range of beautiful corals of all colours and lots of wonderful fish! 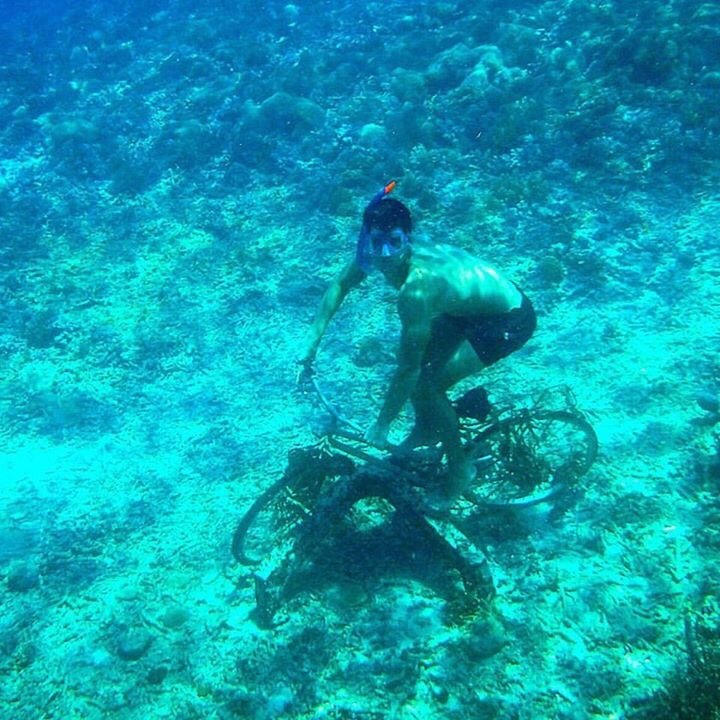 We also found a very interesting display of bicycles and racks under water? We took full advantage of this unique and weird experience..
We finished up around 2pm and headed back just as it started to rain. How’s that for timing? 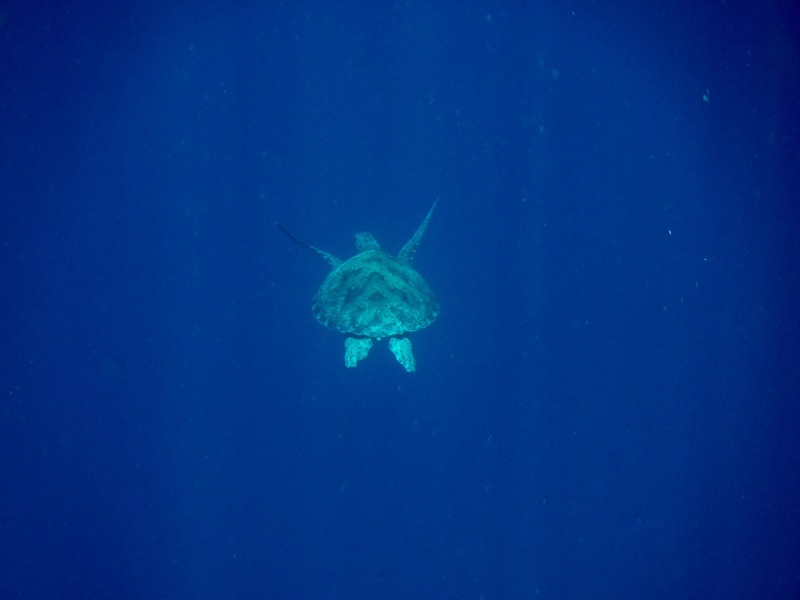 We spotted a total of 7 different turtles throughout the day, some of them bigger than the torso of my body. Crazy stuff. I would say a very successful snorkelling trip wouldn’t you? 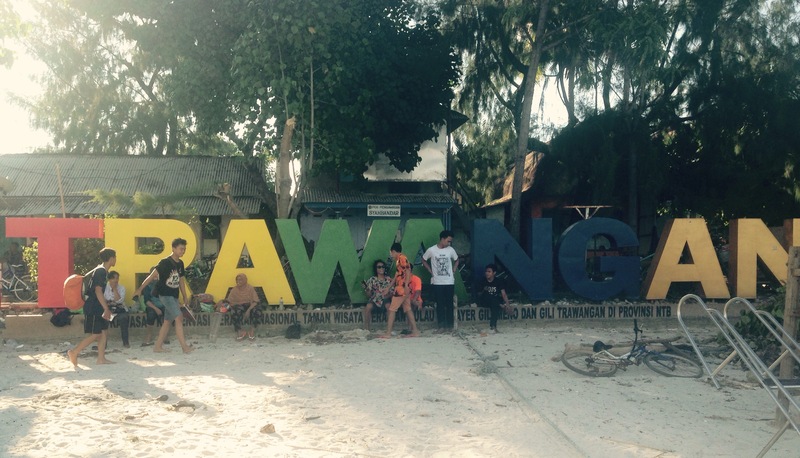 If your visiting the Gili Islands i’d advised you to do this tour. Such a bargain! 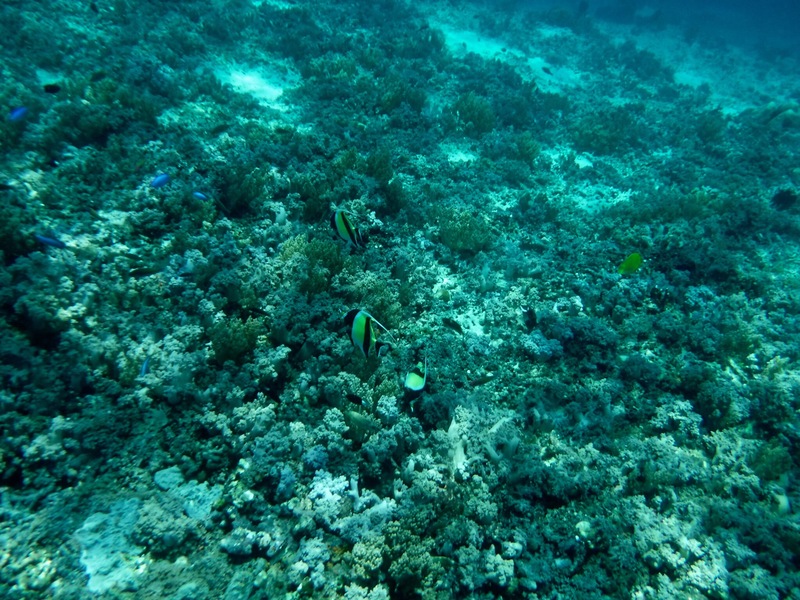 And don’t forget to visit the Turtle Conservations on Gili T or Gili Meno. You can see all of the newly hatched turtles that the locals protect and feed for their first year of life. When they are big and strong enough to fend for themselves, they have a big festival and set them free into the ocean. Please try to make a donation too as its a non-profit organisation and all the money goes to feeding and providing for the turtles. We need to help these mammals as many species face extinction due to various causes! 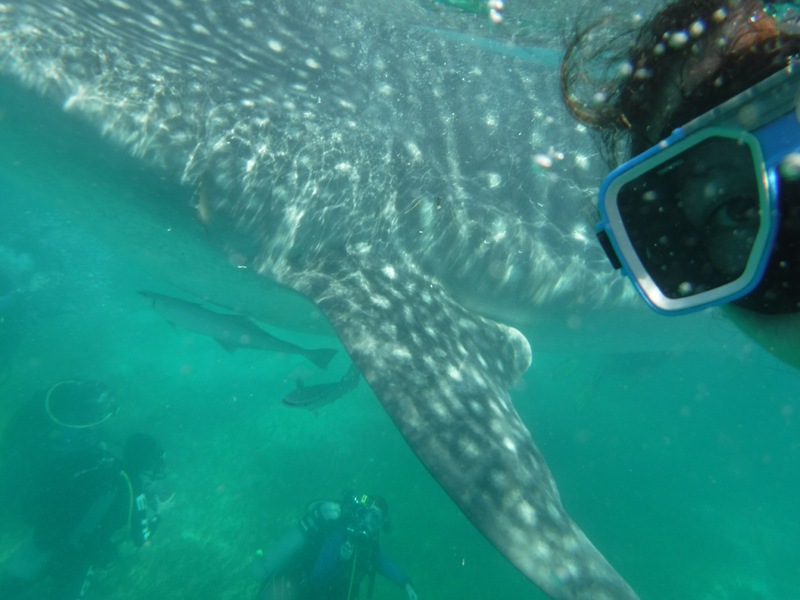 By our third attempt to see sharks in the Philippines, I was more than doubtful. 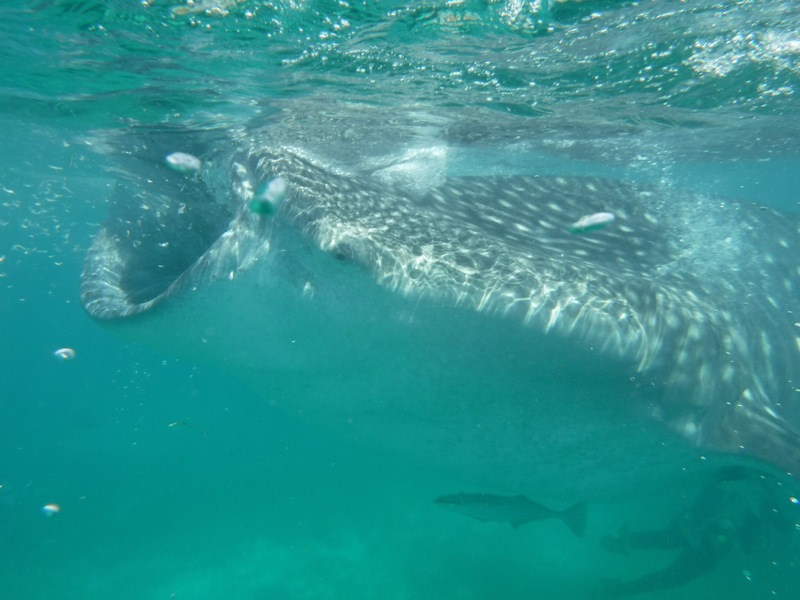 What with our failure of a trip in Donsol and our cancellation of our diving in Malapascua, I was starting to wonder if our chance to see these big giant fish under water just wasn’t meant to be! We decided to stay at Lagunde Beach Resort the night before, instead of arriving straight from Cebu by bus as we had a couple of days to play with. After stopping on the way to run a few errands, we arrived at the Whale Shark watching spot around 9.15am. Sign in, watch the orientation, pay 1000 PHP each etc. We knew the drill by now! We stood anxiously on the beach waiting for a boat to call ’41’.. While we wait, one of the tour guides told us that it’s best to visit Oslob on a weekday as it’s much less busy. Unfortunately it just worked out that we was there on a Saturday. I see her point. There were ques among ques of people, which meant more people and more boats in the water; creating underwater human traffic. ‘Number 41’ a man called. With masks and snorkels fitted, we set off in a small row boat and stopped not far from shore. I jumped in frantically and looking around, aware that we only had 30 minutes in the water. Immediately I was faced with a giant bluey grey spotted body and an open mouth the size of a 15 inch TV. I couldn’t believe it. I thought that I’d be scared but I wasn’t. This giant whale shark was approx. 6 metres long! Underwater in their natural habitats these creatures look big, harmless and cuddly. Well almost. You definitely wouldn’t want to be slapped with the force of their tail, it would probably knock you out. 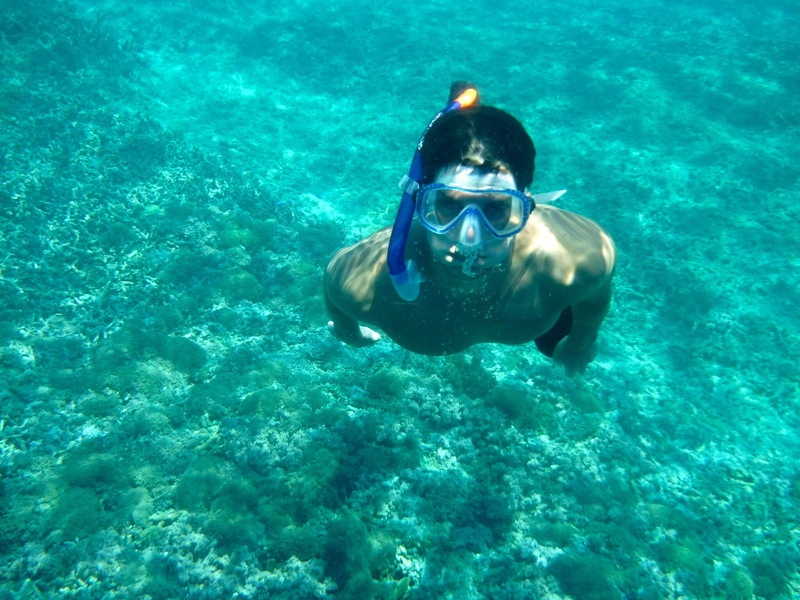 And the fact that they had no teeth stopped me from choking on my snorkel in fear. 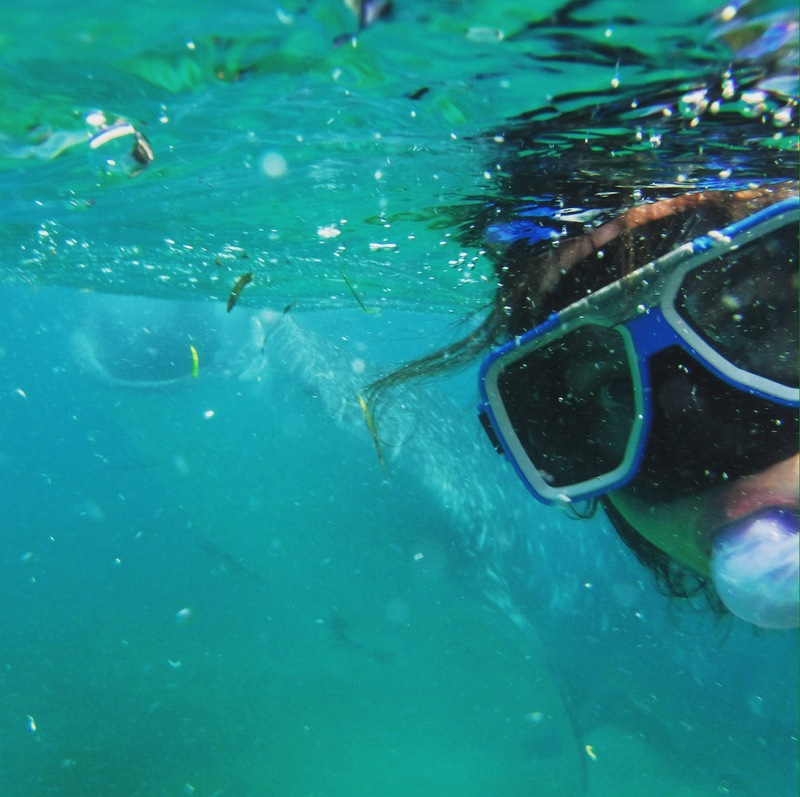 We swam by them freely, struggling to keep up with them of course, taking a selfie or two. Liam and I watched in awe as one of them hoovered up the water sucking in everything in the vicinity. At one point Liam almost got sucked in himself! This experience was the highlight of the trip to the Philippines for me and it was everything that I thought it would be. I’m ecstatic that I finally got to experience this especially as I had almost lost all hope by then. 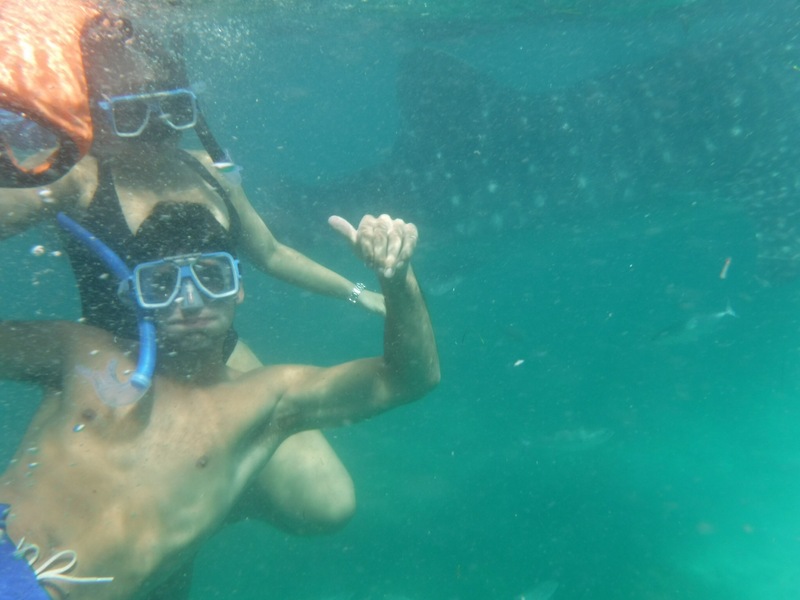 I can now say I have officially swam next to the biggest fish in the ocean!